Today was a mixed bag. Mostly good, but with a little Grrrr tossed in. I felt pretty motivated when I got up this morning, and that stuck with me most of the day. I had Kashi for breakfast, fruit for snacks. Lunch went a tiny bit sideways, I was on the road and stopped in a cafe for a sandwich. 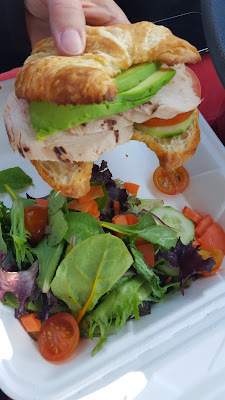 I ordered a chicken breast sandwich, which came with avocado, tomato and cucumber (I had them leave off the aioli and cheese). It was served with a side salad, which I had without dressing. BUT, the sandwich was served on a croissant. I did my routine of only eating half the bread, but OMG, the croissant was so yummy and smelled like buttery goodness. I should've tossed the top half of the bread as soon as I got my sandwich. I think you know what happened. I ate my sandwich but then the other half...I eventually had that too. But (said in a high-pitched voice), I tracked it and moved on, still feeling pretty good about myself. After work I went straight to the gym. I was actually looking forward to going. I knew it would feel good to run and I wanted to feel good. I ran a 4.6 mile loop from my gym, one that includes a hill, and that I ran a few weeks ago, when I was just getting back on the running wagon. Here are today's splits. Mile 3 is obviously the hill. (GAP is Grade Adjusted Pace, which estimates equivalent pace if I'd been running on flat land). And here's a comparison from when I ran it a few weeks ago. Isn't that cool? From an 11:35 pace to today's 10:33 pace. It's amazing how much I've improved already. The other neat thing is when I ran it in January my average heart rate was 154 beats per minute and today's was 148, so faster but not working as hard. Cool stuff. Dinner was a great choice. 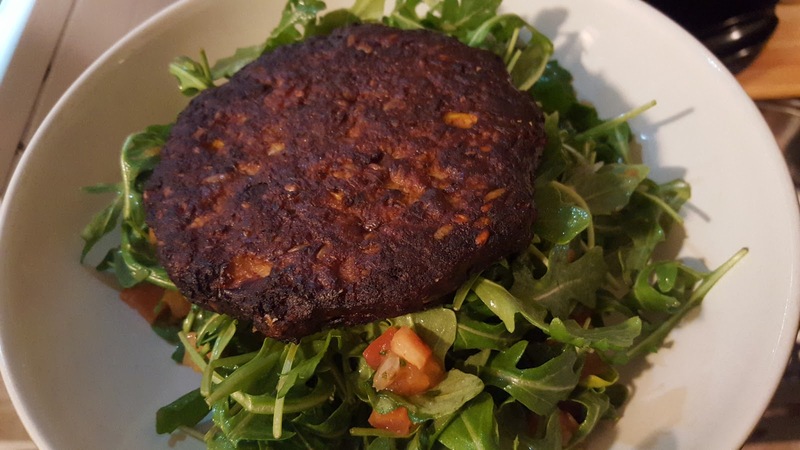 A Morningstar Farms Spicy Black Bean Veggie Burger, over arugula with pico de gallo and spicy green salsa. But something happened earlier today that made me mad and it was still with me. I was irritated, frustrated, all that stuff. 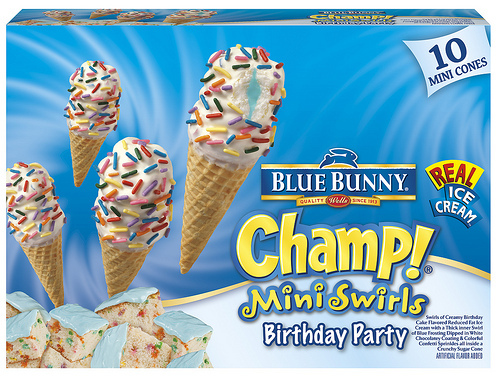 AND, my mom came over tonight to see the kids and brought a box of these little mini-birthday swirl ice cream cones. At least they are "mini"
So after the kids are in bed I had one. I knew I was eating it almost out of spite toward the person I was angry with, like some kind of "I"ll show you...". I know, it makes NO sense. Reminds me of the saying, "holding on to anger is like holding a burning coal with the intent to throw it at someone." After eating it, I started wracking my brain as to how I was going to deal with the other seven that were still in my freezer. Because despite the fact it didn't taste spectacular, I wanted to eat more of them. And then I realized, they have to go. So before I could change my mind, I opened all seven and shoved them down the garbage disposal. Whew! Crisis averted. Later when I tracked it and saw that the "mini" cone was 7 points, boy was I glad they are gone. Which reminds me, I need to talk with my mom about bringing stuff like this over, especially on a weeknight. The kids don't eat stuff like this generally and I get that she's grandma, but really. I mean really, right? I know my eating choices are my responsibility but it's not great for them either to be having this junk, especially during the week when they usually have fruit after dinner. Ok, so four paragraphs about an ice cream cone. But you know what? That's how it is sometimes. This eating thing is complicated, and I believe, for me anyway, I need to understand all the complexity behind what happens, how I arrive at my behaviors, to understand how to change them. Back to the anger...I'm still irritated but I'm thankful that's the extent of it. I got mad earlier today, and I used it as an excuse to make a non-goal-oriented choice...but I stopped it there. 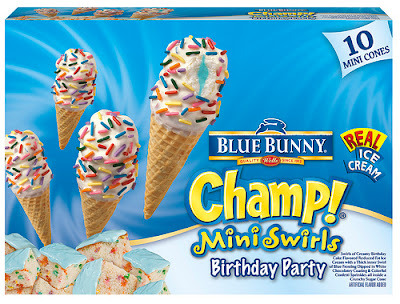 Now at least I only have the anger bugging me and not guilt/regret/frustration over having eaten 3-4 of those damn cones. This is angry eating but definitely very healthy eating. The sandwich is yummy but still colorful (which means very healthy). your Garmin is super cool with all the data it gives you. when/if the one i have ever craps out, i might just seriously look into the one you have. what's the battery life like? Oh, and the battery life rocks! It also finds GPS in, like, 5 seconds. Totally get it. Love your use of the garbage disposal! It's a new day. Thank goodness! And thank you. And I was impressed that you kept it at ONLY 4 paragraphs about the ice cream! Your AWARENESS is always sort of stunning to me. I don't know how to do that, how to practice so that it becomes more habit for myself. And I LOVE your use of the garbage disposal as a tool in weightloss/maintenance. A POWERFUL tool, at that! PS I've been coveting that Garmin 920XT for weeks now and am just about to pull the trigger. Found out they have an "Upgrade" program, and I can get 20% rebate if I send in my old one! Thank you. It takes time to develop the habit of tuning into my own thoughts. It starts with listening to what's happening in your mind. That Garmin deal sounds great! I know I won't ever use my old one now. It's always difficult with the family, they bring you icecream or beg to make cookies for them etc. Ughh i hate when this happens to me. Definitely getting better at controlling my appetite though.